One of my goals for this year was to find my creative mojo. I had lost it. I was writing regularly for various blogs, but this is usually based on special needs so it felt more like work and reporting than being creative. I was feeling lost, I knew there was something missing. Both made me realise that I needed to find something creative, something I enjoyed and also, for me, something not related to special needs. I needed to fire up my creative mojo. So February was my month of experimenting. I have tried crochet and knitting, but it just wasn’t for me. I see other people doing it and I love the results but I just find that I get frustrated with my attempts. I have tried scrap booking but I found I spent too much time comparing my work to other people’s and feeling inadequate so that was a no go. I have journalled for about a year now and love the Bullet Journal community – so many inspiring ideas and so many pretty pictures of how people use their BuJo. 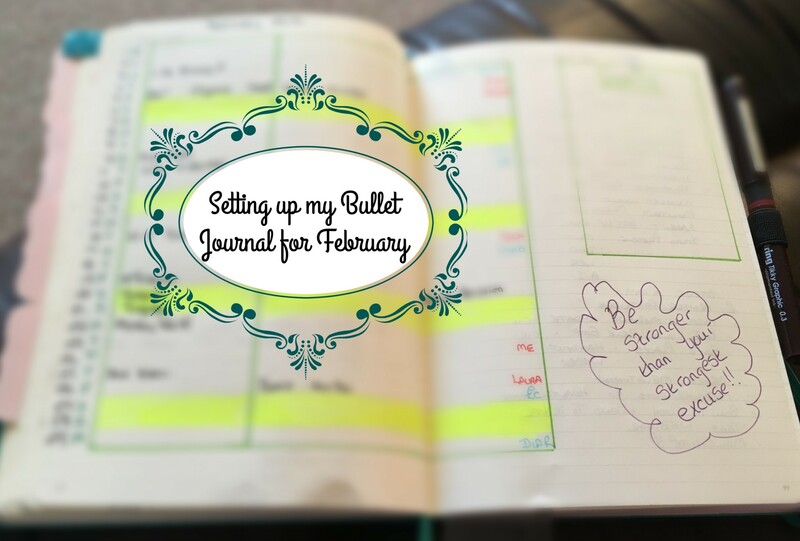 My favourite group on Facebook is Bullet Journal Junkies – if you want to be inspired on how to use one of those notebooks you have stored in a cupboard, pop over there. I promise you will not be disappointed. However, I found I was spending more time making my BuJo look pretty rather than actually doing the things on my To Do list. So I went back to basics and my creative mojo was dimmed again. Oh yes, I really have gone for it this month. I was fortunate to be gifted an old writing bureau. It was old, scratched and in need of much TLC. It sat in my office for a month but then in February, I decided to try refurbish it. So I spent 4.5 hours sanding it down, on a cold windy day. However, much to my amazement, I thoroughly enjoyed it. I switched off from the Chaos and really found myself absorbed in watching the changes as the sander removed years of damage. I wasn’t sure what to do next but thankfully my Facebook friends decided to introduce me to the joy of Annie Sloan chalk paint. When I heard that you didn’t even need to sand down furniture to use it, I was even more excited. So the next day, I found a local distributor (sadly, not a great customer experience but hey) and I tackled the bureau with some “assistance” from my daughter. 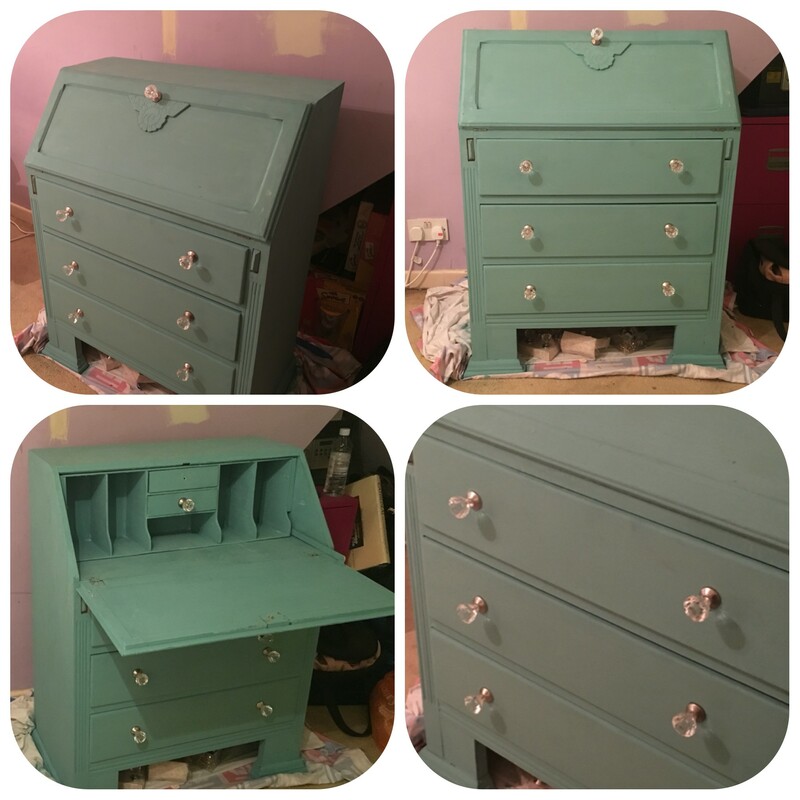 The final result is not perfect – there are a few paint runs on the side – but after adding some new knobs, I am so thrilled with the result. I am now hunting for a chair to refurbish and match to the bureau. I found the whole experience so enjoyable. Having something I created, something you cannot buy in a shop, has given me a real sense of pride. My creative mojo was starting to fly. The paint patches behind the bureau are the start of a new project – redecorating our bedroom to match the bureau! I have never been someone who sews. Hemming school trousers involve ironing web, and clothes have been thrown out instead of repaired. However, I have a few friends who sew regularly and after spending the day with one of them last week, I was impressed with her ability to produce a new skirt as we just sat chatting. 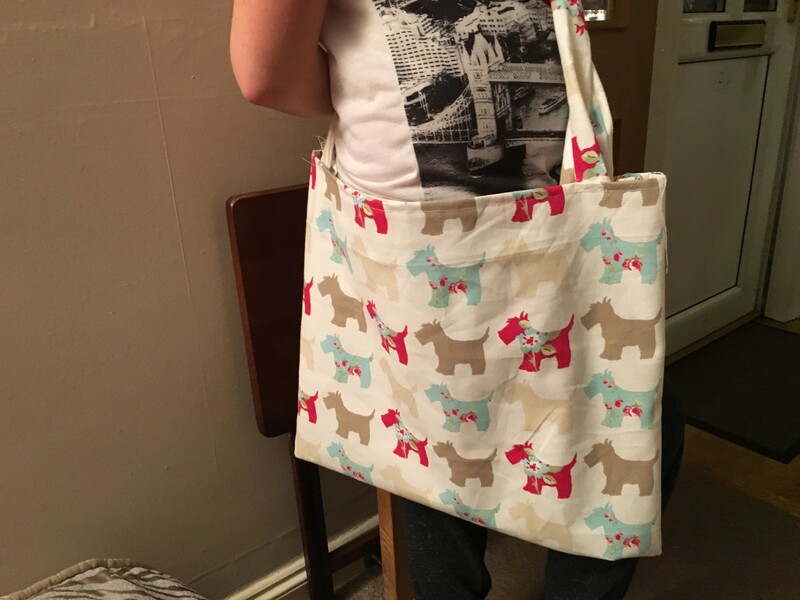 So, as it was my birthday and I received some cash, I decided to splash out on a Sewing Machine and give it a shot. Well, I have shocked myself. I am absolutely loving it. 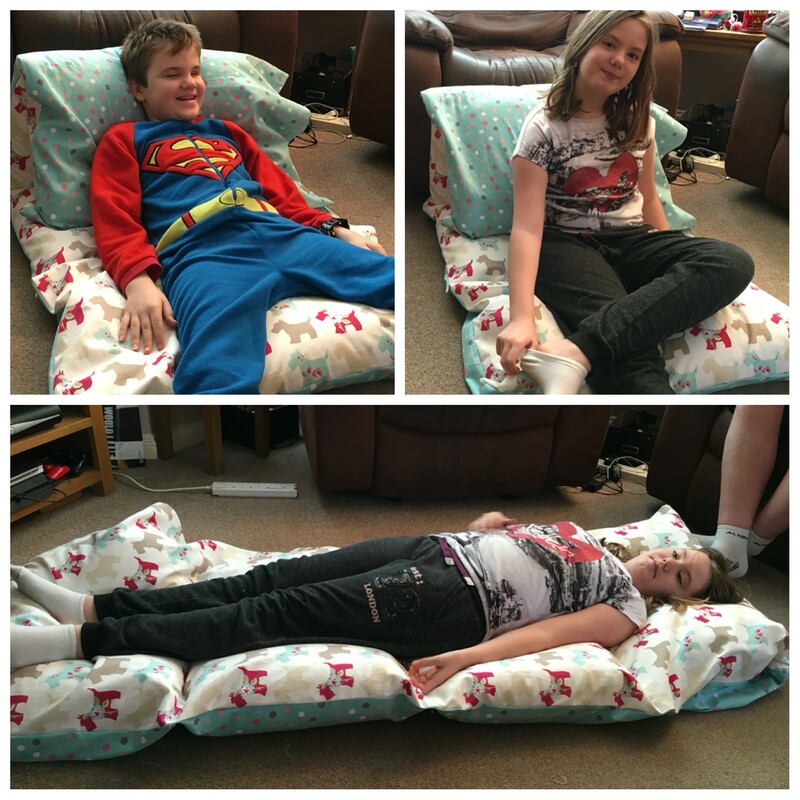 So far, we have made a bag (again, my daughter has helped) and a fab pillow bed. My daughter likes to sleep over in the boys’ room on a weekend sometimes. She did have a crash mat that she used as temporary mattress but this had become tattered and so it had been thrown out. She needed an alternative and she is thrilled with her new pillow bed. I have set up a new Pinterest board – Sewing projects – and I am on the case. I am just loving that feeling of “I made that” and am so excited about the possibilities. My friend called in for coffee this morning and spent most of it laughing at me listing all my ideas. My creative mojo has well and truly arrived! I can mix my new found sewing and furniture skills. An old chair to be painted and the seat to be recovered and then some blinds in the same material. My daughter has put in a few requests for skirts and PJ bottoms so they’re on the list too. I feel so refreshed after a creative few hours and then feel happier to get down to writing what I need to write. I am hoping that my writing mojo will come back now that I have triggered my creative mojo. 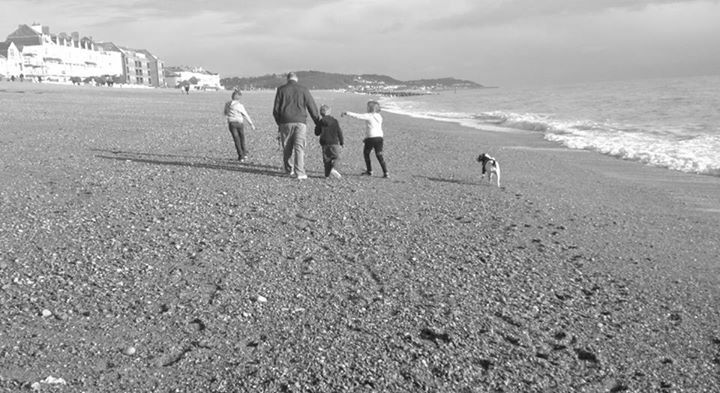 I need to go back to enjoying it, rather than it feeling like a chore. However, first of all, I am going to mix my new sewing skills with my Journalling and I am attempting to make a cover for my BuJo – with a pocket (or two) for pens! How do you stay creative? What benefits have you found? Do you sew? 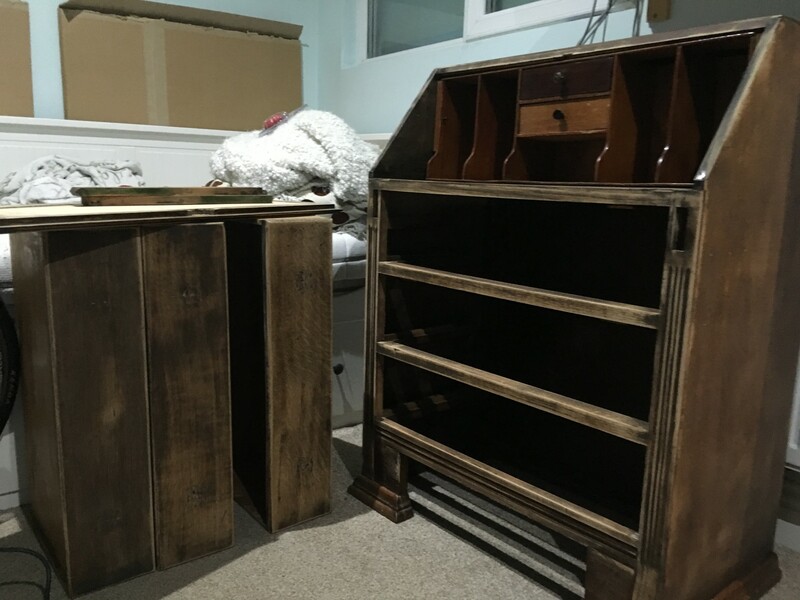 Refurbish furniture? What tips can you share? Next story What if your value was based on how kind you are?